Completely new renovated luxoriöses holiday villa for 12 people in a central location 10 minutes from the Bodetal and cableway in Thale. In the 1st floor there is a living room with mod. integrated kitchen, dishwasher and a large 46 "LED TV, two bedrooms with large new box springs and each one add. 32" LED TV and a nice bathroom with shower and toilet. The 2nd floor they surprised with a huge Ecksitzsofa and a 46 "LED TV on a stone wall in the living room with view from the window on the Hexentanzplatz & the Roßtrappe. A modern kitchen with everything you need incl. A dishwasher. Furthermore, two bedrooms with a large box spring & are additional. 32 "LED TV. The new bathroom has a large shower and a toilet. W-LAN in the whole house can be used free of charge. The property has a large cozy courtyard with a covered seating area has modern seating and is ideal for barbecues. Parking is free in front of the house. 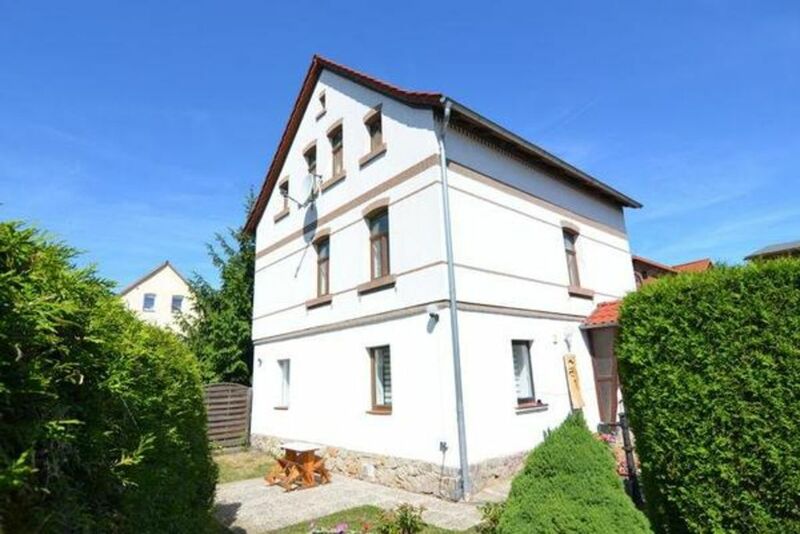 All sights, restaurants and shopping in Thale are within easy walking distance. Alles neuwertig, super Lage, Netter Vermieter, wir werden auf jeden Fall wieder kommen!!!! Vielen Dank noch einmal!!!!! Ein modernes Ferienhaus, das meinen Erwartungen und denen meiner Familie, voll gerecht wurde. Ideal für einen Familienurlaub, sogar Haustiere sind erlaubt und gerne gesehen. Die im Haus ausgelegten Prospekte und die Tips des Vermieters haben es uns sehr leicht gemacht, alle Einzelheiten unserer Ausflüge zu planen. PS: Die täglichen Shows auf dem Hexentanzplatz sind unbedingt sehenswert. to relax and unwind. In summer you can enjoy the new water world outdoors. Thale has become easy in recent years into a popular tourist destination. An ideal starting point for all activities and walks in the valley and around such. B. Quedlinburg & Wernigerode. The house Wotan is so central that everything is within walking distance. Tourist tax (per person per day, by the tenant 2. 5 EUR).